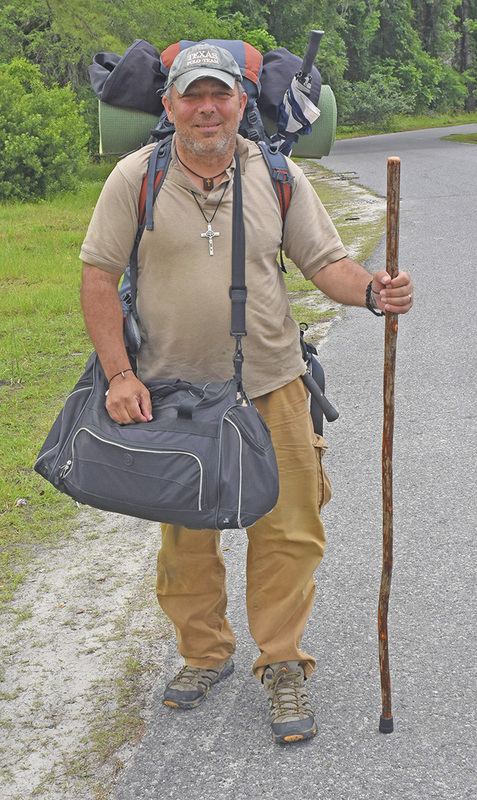 Gregory Wietrzychowski – on a walking pilgrimage of penance and reparation. Reparation is an invisible, spiritual work of repair, of restoration, of rebuilding, of cleansing and of renewal. Reparation is owed in justice, for the damages and insults of sin. Reparation is a work of sacrificial love, following the example of Jesus. Reparation is a silent and hidden apostolate, seeking and receiving no praise of men, trusting only in the Father who sees in secret and rewards in secret. Reparation is an apostolate open to all, and especially to the ordinary. The most common and ordinary of human works can be offered to God in a loving gesture of reparation, and are received in love. The most ordinary of persons, in the most ordinary of lives, can offer in prayer to God the most ordinary of moments – yet in the transforming power and light of love – unto holy reparation in union with the Cross of Jesus. There is no suffering that God permits to us too great or too small that we cannot unite with His holy sufferings on the Cross. Reparation is a work of love, our common vocation. Reparation is a fruit of prayer along the ordinary path to holiness, our universal call. 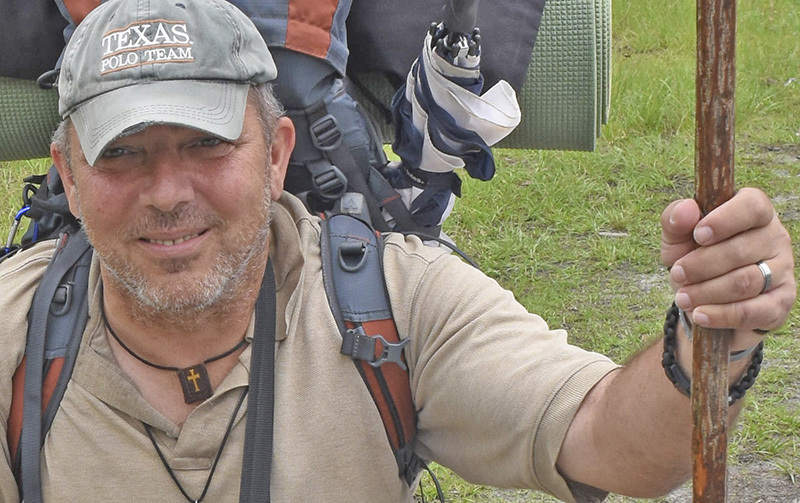 Gregory Wietrzychowski is a man who heard the call to respond to Christ in this apostolate. My wife Deborah and I had the humbling privilege of meeting him and talking with him this week – as we had a similar privilege some weeks earlier, in meeting and talking with Mark Byerly. Mark, similarly, heard and responded to this call of the Lord in a strong and definitive way. You may remember hearing of Mark Byerly, if you read my blog post A Pilgrimage of Penance, Prayer and Sacrifice, and saw the video on that page (the video produced by Michael Voris). I wrote again on Mark and his ministry on a second post, Update on A Call to Desert Hermitage… Mark Byerly. Please pray for Gregory, and for Mark, and for all men and women in Christ who are hearing the call in our time for a full-hearted “Yes!” to our Lord. Jesus is calling His Church to bear witness to His Gospel, His very Good News of holy life, eternal life, pure divine love, clear and unstained truth. A Daily World news interview with Gregory may be found and read HERE. Gregory on the road, in ministry of reparation, in prayer for us all. « Acedia: Spiritual Sloth and the Church of Laodicea, U.S.A. Thanks for the pictures and for sharing our meeting with Gregory recently. Meeting with Mark previously, and then Gregory helped strengthen my prayer for a deeper spirit of reparation, in my own heart, in the Church, in our country and in the world. Our Good God has been so terribly offended by us and we seem only to ignore Him more. Gregory also further strengthened my conviction that love and devotion to Mary needs to include reparation to her Immaculate Heart. It was a joy to hear of his tenderness towards our Blessed Mother and his confidence in the power God gives our Mother to help him and all her children. Our fight is not against flesh and blood but against principalities and powers (cf Eph 6 :12). My Daughter and I met Gregory today August 14 2015 in Haverstraw NY. While waiting for the Ferry to Ossining NY. He walked up with his back pack and walking stick. Crucifix hanging from the chain around his neck. He walked right up to us. Nothing about him was scary. We visited with him while waiting for the ferry. Very nice man. He told us of his journey. When the ferry arrived we got on. He sat a few seats in front of us. After getting to Ossining I asked him if my Daughter could take a photo of him. He said yes. We got off the ferry before him. He caught up to us and talked with us as we walked. He posed for a photo for my Daughter. We wished him luck on his journey. Thank you for your comment, Kimberly, and for an update on Gregory! I’m happy to hear that he is well and continuing his walking pilgrimage of prayer. In the few months since I first met him, it seems our need for prayer – for heroic and selfless prayer – on behalf of this very confused country is even greater now in August than it was then, in May. America, pray! God is very patient, but His patience and long-suffering with us has a boundary beyond which His holiness and justice cannot allow further delay. Pray that we might wake up from the fantasies and contradictions that are now so commonplace – and see the glory of holy Truth in Him, our God! We just met Gregory here in Kansas when he came to Mass at our parish. My husband and I invited him to our home for Sunday dinner and asked him to spend the night. Then the next day I offered him a ride to his next destination about thirty miles away. He cannot ask for a ride but can accept if one is offered. I dropped him off at the Catholic Church there. He was very friendly, has lived many places doing all kinds of jobs and is full of stories, but my favorite was his conversion back to God and the Church. God bless him, and may the prayers of Our Lady surround him as he visits shrines dedicated to her. Thank you for your comment – and for your charity toward our brother Gregory. I continue to be grateful for Gregory – and for Mark Byerly (see HERE and HERE) – two men who said “yes” to the call for reparation and prayer. How we need reparation, and prayer, and divine grace to kindle in our Church the fire of His holy light! The darkness of godless secularism continues to grow throughout the world – yet so many in the Church (in the modern West, anyway) continue in a business-as-usual attitude. Christ calls us to life in Him. Come, Lord Jesus! I just met Gregory today in St. Cloud MN. Our paths crossed as God aligned them as I am very rarely in the area of town that we met. I was able to provide him with a supply bag that our church puts together for people in need. I’ve had this bag for some time and was blessed to be able to pass it on. What a story and journey. He’s a great example for all of us to abandon the things of this world and to follow the call. God bless you Gregory. Thank you for your comment, Matt. It’s good to update everyone on Gregory’s pilgrimage – we pray the the Lord continue to bless him and keep him safe in Christ Jesus.